Some of my batches of Melt-In-The Mouth type cookies were greasy, and I attributed that to not weighing my flour, but most of the batches were pretty darn good. My favorite being the one a commenter named John posted which swaps out a cup of the flour for 1 cup cornstarch. I do believe the cornstarch makes the cookies a little lighter, whiter, and more crumbly and therefore closer to Lofthouse than other recipes. They’re still not the same, but good in their own right. Here’s the recipe John gave me, though I did halve it. I made this batch with unbleached flour, but you’ll get a whiter and slightly less flat cookie if you use bleached. It’s your call, but there’s a difference in texture and appearance. Because the dough I made this morning with unbleached flour kept baking up a little flatter than I liked, I did a little experiment and baked it in paper lined cupcake tins. These were my favorite! The wrappers gave them a cute little ridged look and kept the cookies from spreading too much so there was a better cookie to frosting ratio. Cookie recipe that's supposed to be similar to Lofthouse. I don't think it is, but the cookies are very good. Cream the sugar, confectioners sugar, butter and oil. Reduce speed of mixer and beat in the egg and vanilla. In a separate bowl, thoroughly stir together flour, cornstarch, baking soda and cream of tartar. Gradually add flour mixture to butter mixture. Batter should be too soft to roll, but thicker than actual batter. You can bake the cookies immediately or chill the dough until you’re ready. Chilled dough is easier to work with. When ready to bake, scoop up tablespoons of dough and shape into 1 inch (ish) balls. Place each ball in a cupcake wrapper lined muffin tin and bake for 10-12 minutes or until cookies appear done. Let cool completely. The cookies are very tender, so I froze mine before icing. Ice the frozen cookies. Keep in a covered container. I wonder if using cake flour with cornstarch would make a difference in the texture? 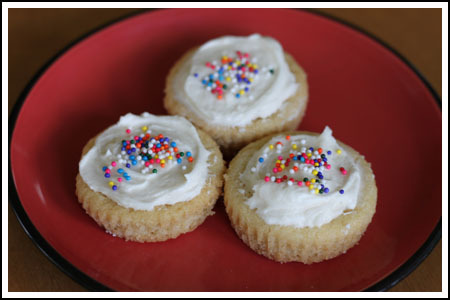 I love that you baked these in the paper-lined cupcake tins. They look absolutely delicious!! Cat, they were definitely tasty. Louise, if that’s the case then it’s a good thing you don’t like them. Also, are you sure that’s not used in the icing? I threw away my ingredient list. Betty, thanks! That recipe looks kind of like another one I use and really like. Not quite the same as Lofthouse, though. Anyway, it’s probably the titanium dioxide that makes them so delicious. I’ll probably never clone them ;).